A deal could soon be inked that would see Toronto’s only castle revamped with a fine dining restaurant, air conditioning and a busier events schedule. 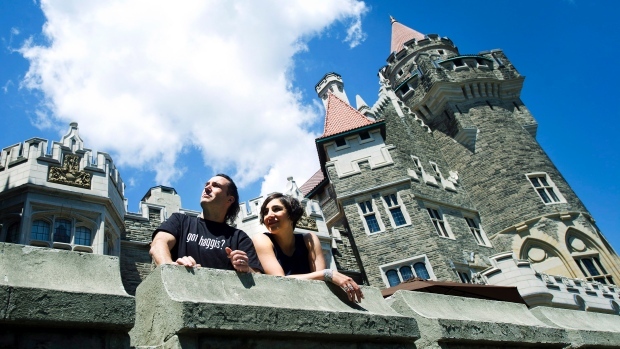 A report by city staff is recommending that the city enter into a 20-year agreement with Liberty Entertainment Group to upgrade and operate Casa Loma. The city-owned Edwardian Castle at Spadina and Davenport roads has been without a long-term operator since a previous operating agreement with the Kiwanis Club expired more than two years ago. “We expect that with this operator the rooms would not be dark nearly as often as they are now,” Councillor Joe Mihevc told cp24.com Thursday. The library and conservatory at the castle are already utilized as a banquet facility, hosting about a hundred events a year. But Mihevc said the site could handle more. Liberty Entertainment Group already operates a number of well-known venues around the city, including the Liberty Grand Entertainment Complex at Exhibition Place, Phoenix Concert Theatre and the Velvet Underground concert venue. Mihevc said the deal would also see a fine dining venue operated out of two rooms on the west side of the castle. He said the city expects such a venue would be on par with other high class facilities operated by Liberty, such as the Rosewater supper club. “Something on par with that is what we’re imagining,” Mihevc said. He also said the deal would see Liberty install air conditioning at the castle, making it more accessible in the hot summer months, and carry out a backlog of other much-needed repairs and upgrades. Reached by phone Thursday, a relative of the castle’s original owner said she’s also pleased with the proposed deal. “I’m very pleased they’re finally opening it up to an open source now,” said Trelawny Howell, the great grandniece of the castle’s creator Sir Henry Pellatt. Howell said she was dismayed that a U.S.-based charity had been allowed to act as the sole operator of the site for 75 years and said she’s been pushing since 2006 for Liberty to operate the site. She said Liberty briefly had a contract to operate the site under Kiwanis several years ago, but the arrangement fizzled quickly. “I hope with Liberty Grand that it will change around and (they) will be brilliant at revitalizing it,” she said. Liberty’s full vision for Casa Loma is set out in a confidential report that will be set before the city’s executive committee next week. The financial details of the proposed deal are still confidential. However Mihevc said that above the base rent, the city would have a share in the gross after a certain income has been achieved. The site is currently controlled by the Casa Loma Corporation, a body set up by the city in 2011 to run the castle and to identify possible options for how to use the site after the Kiwanis’ Club finished its 75-year tenure. According to a recent report from the corporation’s board to the city, the deal with Liberty would mean more guaranteed income for the city with less risk. The report says that the proposed base rent for the site is higher than both historical profits and the projected dividends if the city were to continue operating the site. “The Amounts the city is likely to get are much higher when percentage rent is added to the financial picture – upwards of double,” the board’s report states. It goes on to say Casa Loma’s interior will also receive$ 7 million in badly needed maintenance work in the first five years of the deal. The report by city staff says the city also expects to earn significant revenue from its share of admission fees and restaurant revenues. The report comes a year after city council authorized the corporation to find a new operator for the site after a consultant’s report recommended Casa Loma continue to be maintained as a heritage tourism attraction and a special events venue. The deal with Liberty would cover the main house of the Casa Loma site. A request for proposal process is still underway to determine the future of the northern portion of the site. Mihevc said he’d like to see that portion of the grounds used for a Toronto museum. “We have so many artefacts and stories to tell and we don’t have a place to show off out story,” Mihevc said. Howell also said she’s hopeful the northern portion of the site will be used for a museum and added she’s like to see more of her family history recognized there. “They (the city) have never given recognition to me and my background,” she said. She added she’d also ideally like to see free admission to the site. Casa Loma was built in 1914 by businessman Sir Henry Pellatt. It has been owned by the city since 1933, when Pellatt released it to help pay off his taxes. The report goes before the city’s executive committee next week. If approved there, it will then be considered at the next full meeting of council.